Today is Easter (Pasqua) here in Italy. There has been quite the build-up over the past few weeks – people shopping for food, churches giving out palm fronds on Palm Sunday and beautiful windows filled with giant chocolate, prize-filled Easter eggs. On the other hand, I am pretty sure that no one here other than me (and the couple from NY) had any idea it was Passover or even what Passover is. One day at school we were discussing “our” Easter traditions. When it came to my turn I explained (as best I could, with the help of the teacher) Passover – to a completely perplexed looking group. I was surprised that with all their worldliness (amazing how much they know at age 20! ), the young women from Budapest and Latvia, and the young man from Austria had NO idea what I was talking about! Anyway, in a nutshell, the teacher and I explained “le dieci piaghe d’Egitto” (the ten plagues of Egypt, as it is called) as best we could, and I suggested they get online and watch The Ten Commandments to figure it out (which Steve said he watched last night without me, but it was no fun to heckle cause I wasn’t there – usually saying “shhhhh,” because even after 45 years I still love that movie!). In any case, I was a bit jealous of all the beautiful chocolate Easter eggs (from what I gathered from Italian tv commercials, kids put a real egg next to their bed at night and in the morning it becomes a giant chocolate one filled with surprises!) Low and behold, the place I am staying gave me my own egg earlier today! Below…. The park is the gathering place for friends and family, old men playing games, couples smooching on benches, friends sharing a coffee at the park cafe, and diversions of every kind. I have gone to the park on several Sundays and have admired the life therein from afar – sometimes venturing to take a jog, but not wanting to sit at the little cafes alone. I can’t wait until Steve and I are here together and we can walk to the park and sit at one of the little tables with flowers and have a cappuccino (only before noon) and people watch. It started in 2002 when we came up with a 5-year plan to save for 5 years, then quit everything and see the world. In 2008 we did just that – and ya know what – the world is COOL! Especially Europe! We loved our time here and have been trying to find a way back ever since. I’ll skip the not-very-interesting handful of years in between and get us to my birthday this past January. That was the day Steve was in London interviewing at the Counsel of International Schools job fair. As you may know, he is currently a SPED Administrator, but was interviewing for teaching positions all over Europe. He had several job offers and much interest, but as soon as the offer from the International School of Florence came through, all others fell aside – as Italy was our true goal! Nice birthday present, yes? We both love Italy (and not JUST for the food) and it will get us within a Ryan air flight or train ride to the rest of Europe – pretty darn cool!!! In any case, here we are -with me as the “scouting party” – coming early as I had the time to learn some Italian and find a place to live (and learn a hundred little unexpected lessons in the process). I share a couple of photos from that 2008 trip – the most wonderful chocolatier in the world – Dumon in Brugge; us in our new country, and a photo from our new city….Thanks for reading! As most of you know, I came to Italy the beginning of March with two main tasks at hand – learn some Italian and find us a new home in Florence. For the first two weeks I did not know which way was up, and both of those tasks looked insurmountable. Everyday was a test to see if I would stay or take the first plane back. But just when things looked bleak, someone or something would come to my rescue. For the first two weeks in Bologna I was sleeping on the dirty floor of an American woman who shall remain nameless. I could write for a day just about that experience, but will suffice with a photo of my quarters, below. In sum, I learned many valuable lessons (I usually don’t fly by the seat of my pants for good reasons, you get what you pay for, never pay in full upfront, being a Buddhist about stuff is hard work, everything happens for a reason, yada yada). During the first week I was actively searching for new accomodations and secured (sprung for) a solo apartment 2 minutes’ walk from the school starting after the second week. Also during this time I kept hitting walls – I had sent some personal items and books priority mail several weeks before my arrival…when I got to school on Monday the box had still not arrived. About a week later, the owner of the school told me my box was being held by customs and I had to fill out forms (this is the first time a nice young man from Texas A&M came to my aid – to fill out customs forms in Italian and say the right things). After submitting the forms, my box arrived later that week, though I had to pay a [tax? fee? bribe?] for the Italian post to release my box. I was feeling rather sorry for myself, but soon realized what a great learning experience this was – we were looking at sending boxes and boxes of stuff when we move – now I know the system, how to fill out the forms, budget for the fee (still don’t understand what that was for), and that we don’t need most of the stuff I planned to send. The nice young man from Texas A&M (who has lived in Italy for 8 months with his wife and speaks near perfect Italian) came to my aid yet again when my new little laptop got a horrific virus (all that convorting with unknown Italian sites). I was trying to Skype with Steve one night in the kitchen of the horrible first apartment (it was the only place the internet worked, so I could only skpe when the woman was not home, which wasn’t often), and all of a sudden a gazillion virus warning boxes started popping up – needless to say, this was not the first nor last time I would find myself in tears (Skype has pretty much been my lifeline and connection to Steve throughout this process). The next day at school the Aggie took my computer home, wiped the hard-drive and re–installed everything – sooooooo nice and sooooo lucky for me. I was happy at that point that one of the things in my box was a jar of green chile – a fitting, if inadequate gift for my twice-saviour. I could tell many more stories of funny errors I made and how in the end it all worked out. The many people I met at the school (Madrelingua)- both students and teachers – really made all the difference – people took me under their wing, took me to dinner, gave me advice, etc. It truly made a world of difference. Suffice to say almost 5 weeks later I am feeling much differently and am totally ready for this adventure. I can now “speak” Italian – I can actually sorta talk in 5 different verb tenses and have enough words that if I don’t have the right one I can describe what I mean. I have an Italian cell phone, and Steve and I got our “codice fiscales” (like SS#’s). And…finally, after 3 trips to Florence and learning to navigate the complicated real estate system (you have to pay an agent to find you an apartment! ), we have finally secured our new home! It is in an old building in an authentic(i.e. not swarming with tourists) part of town, and other than the 4 flights of stairs, pretty cool. It has a very old/Italian style to it – figure it will be funky/cool with some of our own things, and the best part is the roof terrace and Jacuzzi tub on the attic floor (also the guest bedroom). 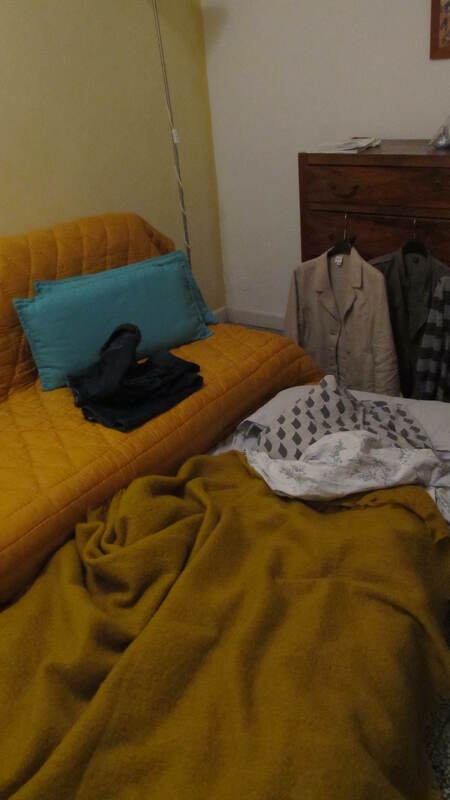 Apartments in Italy come furnished – I mean everything from actual furniture to plates and pots and pans to pictures on the walls – so you actually don’t need anything, but it’s nice to make a place a little like home. I am sure I have forgotten some interesting tidbits, so will add as they come back to me. Will definitely be writing more on the food (i.e. gelato and cheese) in days to come. Thanks for reading!!! Looks like I have finally relented and have arrived in the 21st century and have started a blog! This will be the place where I share the exciting (and intimidating and a little crazy) experience of moving from Albuquerque, New Mexico to Florence, Italy! Stay tuned….